This dress is gorgeous and too good to be left hanging in a cupboard! 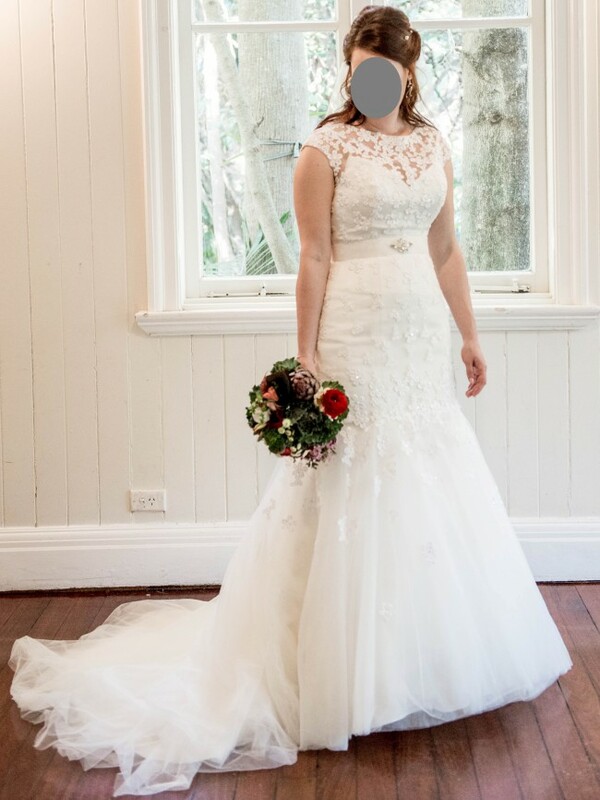 The dress is a standard size 10 and fitted me perfectly. I only had the straps on the satin under-dress shortened to fit properly (they were way too long) and the shoulders on the lace overlay had a very small adjustment to sit better. The main part of the dress has a full bodice with 10 internal hook fasteners to ensure that everything stays in shape. I am 172 cm, and with a small heel the dress was the perfect length. If you are shorter, this would still work well with taller heels. The dress was cleaned after the wedding, with no stains or marks. The dress comes with a full-length fabric storage bag. The dress is a fitted satin under-dress with hidden zip up the back, with a lace overlay that has crystal buttons all the way up the back and a boat neckline. The dress is fitted until about hip-length, then becomes fuller and flowing into the train. There is a tulle and beaded appliqué belt that is removable. The dress can be worn with or without lace overlay (underneath is a plain satin dress). Happy to arrange a time for viewing/try-ons. Located in inner west of Brisbane (4068, Qld). Minor adjustment to straps on satin under-dress. Minor adjustments to shoulder on lace overlay so that it sits better.